Is this a science book that thinks its a cook book or a cook book that thinks its a science book? Who cares! This appetizing workbook introduces you to some of the amazing things that happen when you cook. 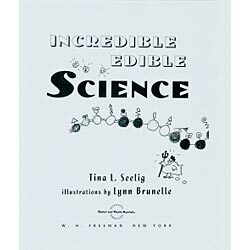 Discover how chemistry and physics make your favorite foods what they are and prepare a tasty treat for your taste buds. Topics covered include solutions, acids and bases, sugars and starches, proteins, and cells. "Experiments" explore why water boils while making couscous, the difference between baking soda and powder while preparing buttermilk raisin muffins, what makes popcorn pop while mixing up a batch of popcorn nachos, and 15 other yummy science activities. Glossary, index. 80 pages in a three-ring vinyl binder.